Convenient ready-to-eat low carb snack pack with just 2 net carbs per serving. Low carb, gluten free and no artificial sweeteners. Delicious and satisfying low carb snack to go! This low carb snack pack has a tasty combination of freeze dried monterey jack cheese, dry roasted unsalted pumpkin seeds (pepitas) and dry roasted unsalted almonds. Available as a single pack and in quantities of 6 or 12, for your convenience. These snack packs are great! I never would have thought to put these three together. You guys always find away to make staying on track easier. Thanks!! I've purchased other items on this website and I've always loved what I've received, but when I this was included in my monthly keto box it became an instant favorite! It has such a nice flavor and texture and I find myself craving it all the time. Love this! Great for a snack. Also wonderful in salad. 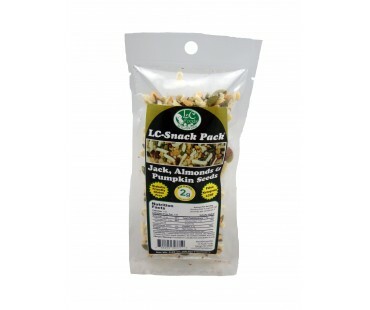 Love the crunch and taste it gives to my salad and I'm not even a pumpkin seed fan but this snack is delicious.